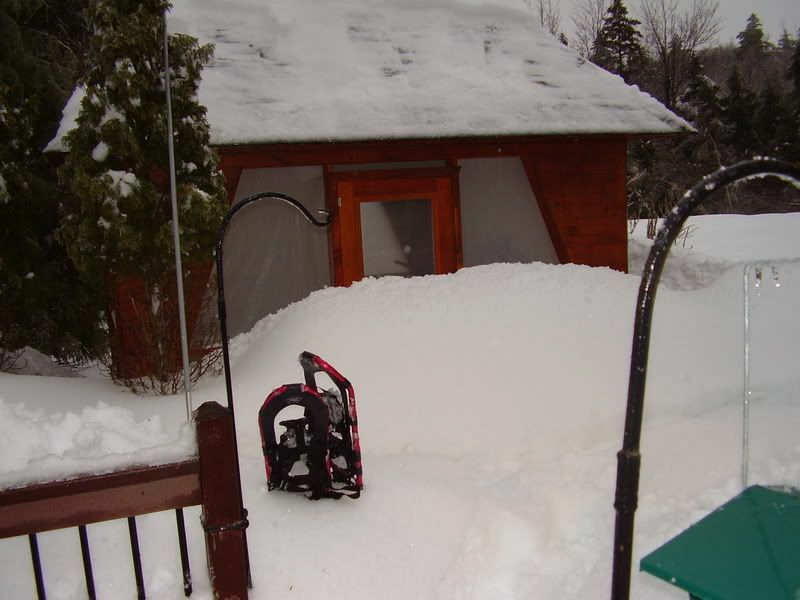 PB: That would be a hoot I always thought that was the best thing about winter back there was getting out on the tractor or using the snowblower. The neatest part was doing other peoples driveways after getting mine done. There were about 5 or 6 of us in the neighborhood that would help each other do the other ones driveway and walk. SB: I promise, this has not been a fun snow blower winter. 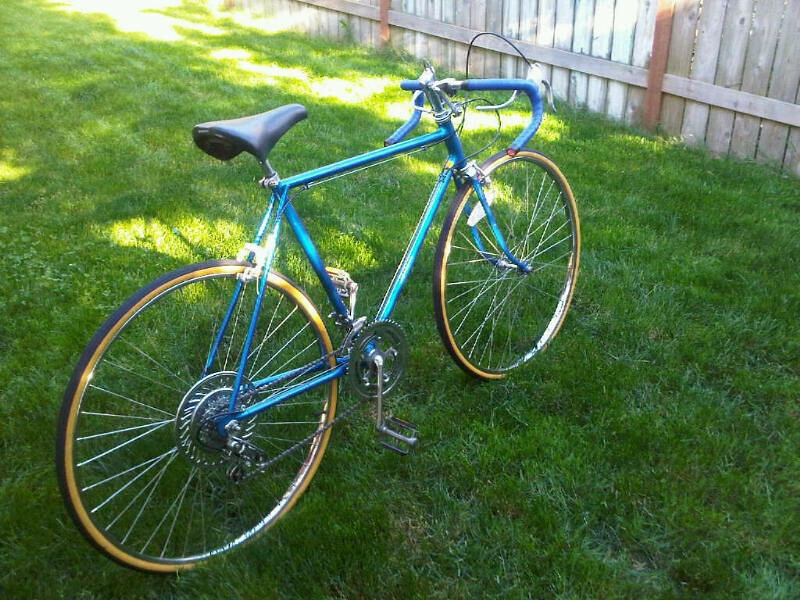 You own a real piece of American bicycle history -- the only thing better would be a rare 1960 Varsity 8 speed. 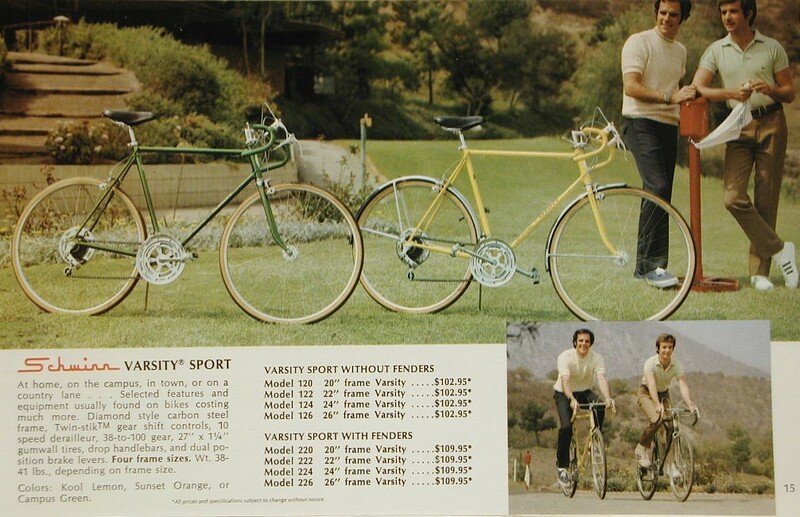 Keith Kingbay, a retired bicycle racer, had a very tough time convincing Frank Schwinn to add the popular-priced Varsity and Continental 8/10-speeds to the Schwinn lineup, yet the Varsity went on to became the largest selling bicycle in American history. This was a homerun product that almost did not happen. Thant was my first Kool Lemon Dump Find Varsity. It was sent to imabeliever in TX last summer. The second Kool Lemon Dump Find Varsity, which I single speeded, I donated to a charity silent auction. A kid in the church won it and he wants to put it back to as close to original. I guess I better start cleaning the derailleurs! And I'd be glad to give you all the snow you can take! Oh, that's beautiful! Spoken like a NC resident who hasn't seen any snow, to speak of, in three years!!!! OY! I know I'm late to the schwinn game here on this thread, but seeing how you never know who might also be working on their own Varsity I thought I might revive the thread and talk about the '73 Schwinn Varsity (in Sunset Orange) that I just picked up to restore. I'd found this baby on craigslist and bought it off some old gentleman. I've stored some cars in my youth and worked on an RV I lived in a few years back and now that I've given up the car and ride a bike 100% of the time I thought it would be fun to post my progress and of course get any tips and tricks some experienced cyclists might have to offer. Since you mentioned doing a restoration note that the saddle currently on there is not original, it appears to be a large mattress saddle from a Suburban. 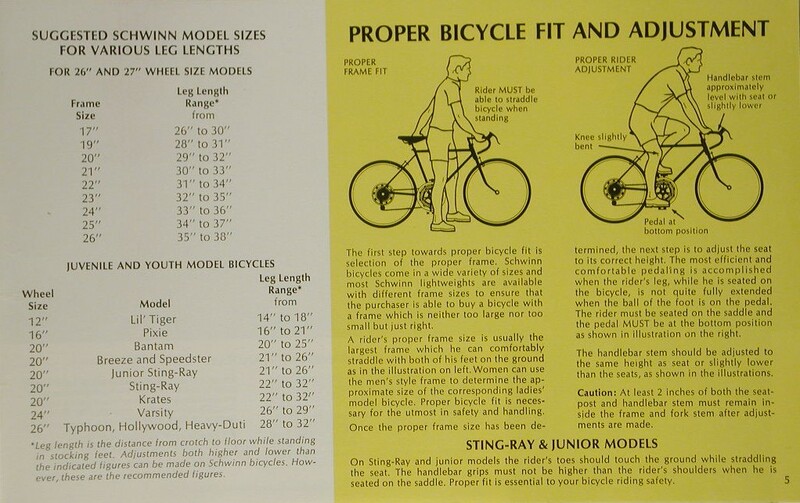 The 24" wheel Varsity came with a small version of the Schwinn Approved "racing" saddle, made by Mesinger for Schwinn. The bike also appears to be missing the extension (aka "safety") brake levers, other than those items (and consumables such as tires and cables) the rest appears to be original parts. Last edited by Metacortex; 11-09-17 at 11:07 AM. Thanks for the info. The pages are great, I figured it was a kids buy or something like that. Thank god I'm short, 5'2", so the bike height is actually perfect for me. I got it off a guy real cheap off craigslist. I just got into bike commuting and all and wanted to have some fun with a buster and see how good I can get it back to life. I'm just going to clean the chrome myself, and spray can paint it after I have the local bike co-op help me out with taking apart the fork and what not. I'll get a different saddle, thanks for pointing out the change (I always appreciate sharp eyes). I noticed the top bar brake handles are missing, I'll see what I can do about those but I'll get to that when I get to that I guess. No matter what I'm stoked, I loved restoring a few cars as a kid and am stoked to be able to do the same thing with some bikes. couple of things not mentioned above: WD40 is fine for cleaning, loosening, etc. but not adequate for lubrication. Get some hub grease for reassembly after cleaning. I'm partial to Marine trailer hub grease for its water resistance. Thanks for the hub grease tip, Don! One disadvantage of the Super Sport or Sports Tourer for the OP may be size. Sounds like this smaller Varsity with the 24" rims may be a perfect fit for him. When it comes time to do basic service sufficient to get started and test out the bike for it's fit, handling and basic performance, the most important thing is to get everything sufficiently lubricated and adjusted for it's first dozen or two rides. So initially, I do an "oil-can tune-up" on my porch, leaving everything assembled where possible and simply addressing things like cables and bearing adjustment. Tight bearings are far worse than bearings that are lubricated merely with a shot of oil, since tight bearings soon self-destruct and can grossly impair the steering. I also remove cables where needed so as to chop off any bent ends of cable housings, which yields a bit of extra length in the inner wire's path and so allows any frayed end of the wire to be trimmed a little bit. Unfortunately, the Varsity's derailers tend to severely crush the cable wire where it is secured with the pinch bolt ("binder bolt"), so new wires will be good to have at hand. I also make sure to oil the shift lever pivots internally and to verify that the derailers move freely. I don't recommend increasing the gear count even with an Ultra6 freewheel, snce the Varsity's derailers have very limited travel unless modified as shown below in red (and even then are very hard-pressed to deliver shifts across a standard 6s freewheel). Original brake pads on a used-Varsity purchase seldom work any more, but replacements should be steel-rim compatible. The 27"-wheel Varsity/Continental bikes are very good candidates for 700c rim conversion using the stock brake calipers, but the fork ends of a Varsity are too narrow for common 9mm axle diameter without some file work. Axle cones and locknuts on the right end of the rear axle should be inspected for full tightness against each other and that the axle isn't bent. 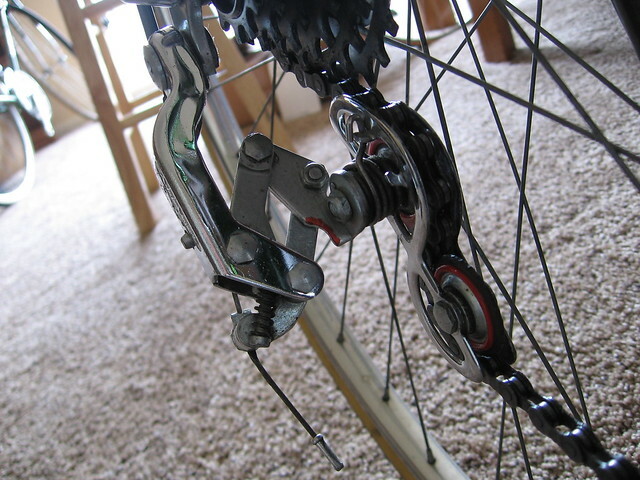 A loose bearing cone on this side of the rear hub can be forcefully over-tightened by the hub's rotation, which can destroy the bearing cups in the hubshell. Even without removing the freewheel, the axle nut and cone on the left end can be removed so that the axle can be pulled out from the right side ("drive side") of the hub. Good handlebar tape and saddle always do much to improve the Varsity's comfort level! Last edited by dddd; 11-11-17 at 11:36 AM. 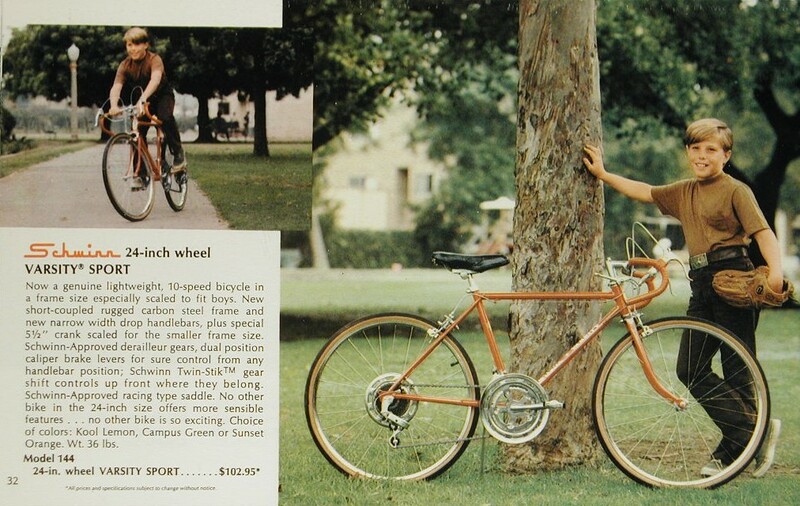 The 24" wheel Varsity had an 18" frame. Thanks Don! I'll keep an eye out for those other bikes. You never know what will need new life. I haven't worked much on my bike with the holidays and just not feeling it after the holidays, but now with some sun and spring looming I'm jumping back into working on the old girl. Managed to get the old cracked tires off the rims and the busted tubes. Cleaning the chrome right now and thinking about respoking the wheels just to give everything an amazing cleaning. I'd like to try and make this baby as buttery as possible. Thanks for all the advice y'all. I'll post some new photos after the weekend. Last edited by thecalifaskid; 03-09-18 at 11:01 AM. there is allot of great info out there. A few resources online - Sheldon Brown, Mytenspeeds (forum member) and on youtube RJ the bike guy Have fun. A varsity was my first rebuild.